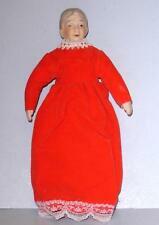 Dolls are by Swiss doll maker, Heidi Ott. Both have hand painted faces and blue eyes. 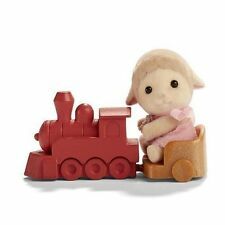 The toddler is 2.75" tall with soft granulate filled body and the baby is 2" long. Toddler is new Heidi Ott model XKB09. The 2.75" doll is by Swiss dollmaker, Heidi Ott, and features hand painted face, blue eyes, blonde hair and highly detailed tiny fingers and toes. The doll has a granulate filled body. The wooden rocking horse chair is not a Heidi Ott item. He is a new Heidi Ott model XKM09 with new wig #12 added and facial hair added. Undressed man for the dollhouse. 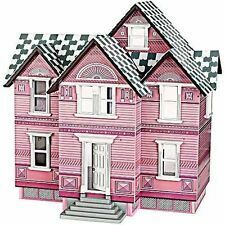 Perfect for dollhouse decoration. 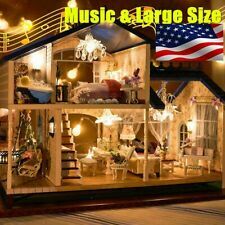 1:12 Scale Miniature Porcelain Bearded Man Model Toy for Dolls House Decor. 1 Miniature Bearded Man Model Toy. Mini Bearded Man for doll house decoration, cute and attractive. This kit creates the dress, bonnet and bootees, all knitted in very fine and delicate lilac silk. The kit contains superfine lilac silk thread, a pair of 1mm (19/00000) knitting needles, the pattern, 2mm silk ribbon and bead buttons for the openings. Good Vintage NRFB Mid-Century CACO DollHouse Doll Grandpa Germany In Box. Condition is New. But show show a bit of wear. Shipped with USPS First Class Package. Little boy for the dollhouse. Doll is a new Heidi Ott model XKK06 with new Heidi Ott doll wig added. Doll is by Swiss dollmaker, Heidi Ott, and he has brown eyes and hand painted face. The little boy is 4" tall and he has a cloth body over a wire armature which can be posed but he does not bend at the knees and can only sit with his legs straight out. 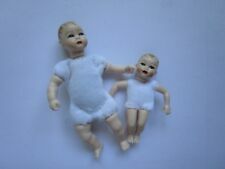 This is an amazing lot of small vintage dolls. Some of these are Dollhouse dolls, others are just small dolls, like the little kiddles doll in the back row. The larger dolls off to the left are a bit more modern, late 80s early 90s, but I only had a few so I figured I would throw them in. The Tutti Frutti packaging has been squished a little bit, as shown. The carrying case for the Miki doll is also damaged. Please look at the pictures and ask any questions you may have before buying. Dolls come from a smoke-free home but have been in storage for a while so may need some cleaning. They are from my owen collection so can I gurantee for the age. 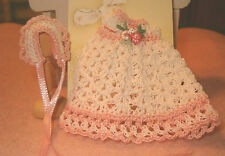 This pretty miniature baby christening gown and bonnet are all handmade using thread and crochet stitching. 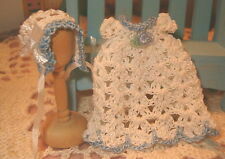 gown and bonnet are all white with white ribbons and is lovely on doll. Melissa & Doug Poseable Wooden Doll Family of 7 for Dolls House XY13004 2"/4"
The 2" baby dolls are by Swiss dollmaker, Heidi Ott, and feature hand painted faces, painted hair and highly detailed tiny fingers and toes. One has blue eyes, one has brown and one is asleep. Dollshouse baby dolls - set of THREE. BEAUTIFUL - BELGIAN - DOLL WITH DOLL CARRIAGE - STROLLER - GREAT GIFT ITEM! Makeit Porcelain Doll Kits "Angel For All Seasons"